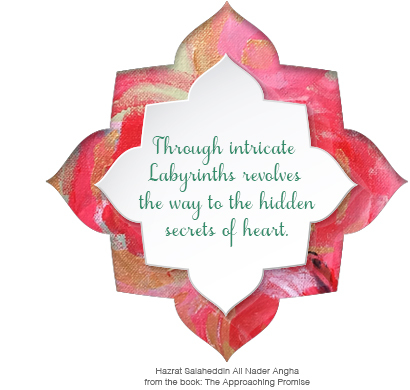 "In the realm of the divine, only the secret of the heart is relevant." Religion began when people started to worship the powerful forces of nature, creating representations of them--- constructing idols. They forgot that a symbol is not reality. The Prophets were then sent to teach people this worship was incorrect and to tell them how to follow the path to cognition of and unity with God. The coming of the Prophets marks the advent of Sufism – for Sufism is the teaching of how to cognize and become one with the Divine Beloved. But people accepted the Prophets' teachings out of obedience, not because they knew God, and they shaped the Prophets’ instructions to their own liking, using words as symbols in place of symbols made of stone or wood, devising new idols. They created God in their own image. From the time of the Prophets on, the most learned and spiritual tried to explain the way to the truth of Existence which the Prophets had taught. Because their ideas were presented differently to different societies, the result was a gradual emergence of divergent groups, and society began to speak of religions. Over time, these groups often were in conflict, ostensibly over religion, but actually over wealth or power. However, the reality of religion is not based on the differing practices and rituals that have developed over the centuries. God is the foundation of religion, and God cannot be found through the mind and the physical senses, nor from reading or hearing the words of others. The discovery of religion is the discovery of the innermost dimension of our own being, from which the divine attributes flow. This is what the Prophets cognized. To make their discovery requires devotion, discipline, and precise training, which Sufism provides. In order to attain this goal, to know the "I", the "Being" of our self, knowledge is required. Such knowledge in not to be found in the usual social sources, but one must move beyond these limited boundaries. This "I" is the basis of Sufism, which follows the Way of the Prophets toward the seed of Truth lying within every human heart. In this sense, Sufism is a bridge between all "religions", for it accepts all the Prophets. This emphasis and insistence on the personal experience and knowledge of God and the discipline and method of training which assists students in the path toward this goal is the structure which makes Sufism the bridge among the "religions", both in our inner being and in our world. 1.Nader Angha, Sufism; A Bridge Between Religions (Riverside, CA: M.T.O. Shahmaghsoudi Publications, 2002), 51-53.